However, other networks were not so quick to apologize for rushing into the apartment of the two accused San Bernardino shooters. 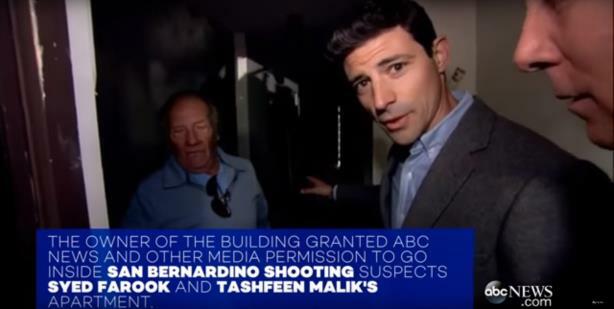 MSNBC apologized on Friday for its part in a media frenzy at the home of Syed Farook and Tashfeen Malik, who are accused of killing 14 at a San Bernardino, California, facility on Wednesday. Networks including MSNBC, CNN, and CBS aired live footage from inside the San Bernardino home of the two suspects. The reporters were quickly criticized on social media, with many users wondering if the journalists on-scene interfered with an ongoing investigation that authorities said on Friday was being looked at as an act of terrorism. Analyst Harry Houcik said on CNN: "I’m having chills down my spine with what I’m seeing here…this apartment clearly is full of evidence." Others questioned whether the owner of the building actually gave reporters permission to enter. "MSNBC and other news organizations were invited into the home by the landlord after law enforcement officials had finished examining the site and returned control to the landlord," the network said, in a statement. "Although MSNBC was not the first crew to enter the home, we did have the first live shots from inside. We regret that we briefly showed images of photographs and identification cards that should not have been aired without review." CNN said via a spokesperson: "CNN, like many other news organizations, was granted access to the home by the landlord. We made a conscious editorial decision not to show close-up footage of any material that could be considered sensitive or identifiable, such as photos or ID cards." A Fox News spokesperson explained via email that their own reporters entered the suspects’ home to report on what they saw after receiving permission by the landlord, and after the FBI investigation. "We exercised cautious editorial judgment and refrained from showing close-ups of sensitive information, including specific identifications and photographs," said the Fox spokesperson. Other networks, such as CBS, could not be immediately reached for comment. Many viewers were outraged by the segments. Per the @WhiteHouse, there's an ongoing FBI investigation into #SanBernardino. There's NO WAY that house is legally open to media.